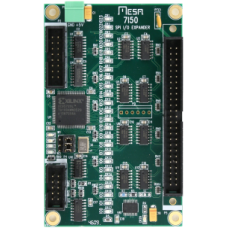 The 7I50 is a 24 I/O SPI expander for use with MESAs Anything I/O cards. 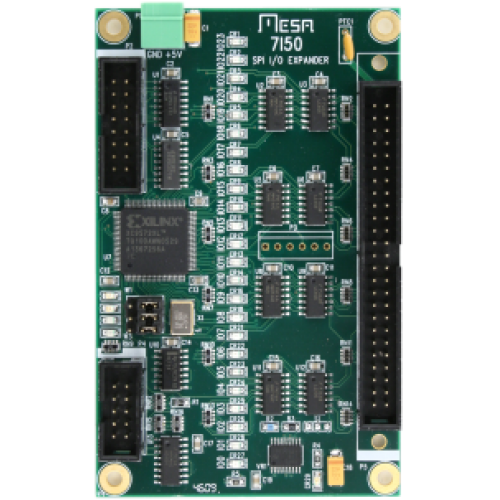 The 7I50 has 24 bidirectional logic level I/O pins and connects to a SPI interface. The 7I50 can use a TTL level SPI interface or differential SPI. One Anything I/O connector can drive six 7I50s for a total of 144 I/O points per FPGA card connector (the 7I46 SPI breakout is a convenient way to wire multiple 7I50s). SPI data rates up to 8 MHz are supported allowing a 4 uSec update cycle. The 7I50s I/O connector is a 50 pin header that matches the pinout of the Anything I/O card and is OPTO22 compatible. I/O pins are open drain and will swing to 5V.Outputs will sink 15 mA. A buiilt in watchdog sets all outputs to the inactive state if the 7I50 is not accessed with the proper code with in a selectable timeout interval. I/O status LEDs are provided for all 24 I/O bits, and SPI link status LEDs monitor SPI connection integrity.